Some of your friends might have just graduated, others are already starting their new lives with their partners. And being new homeowners in Singapore, most of them probably would have gone down the BTO route and are planning for their new homes. But what if you’re still single and have no idea what to get for your recently BTO-ed buddies? You don’t want to get them something that just lies in the corner gathering dust, forgotten. 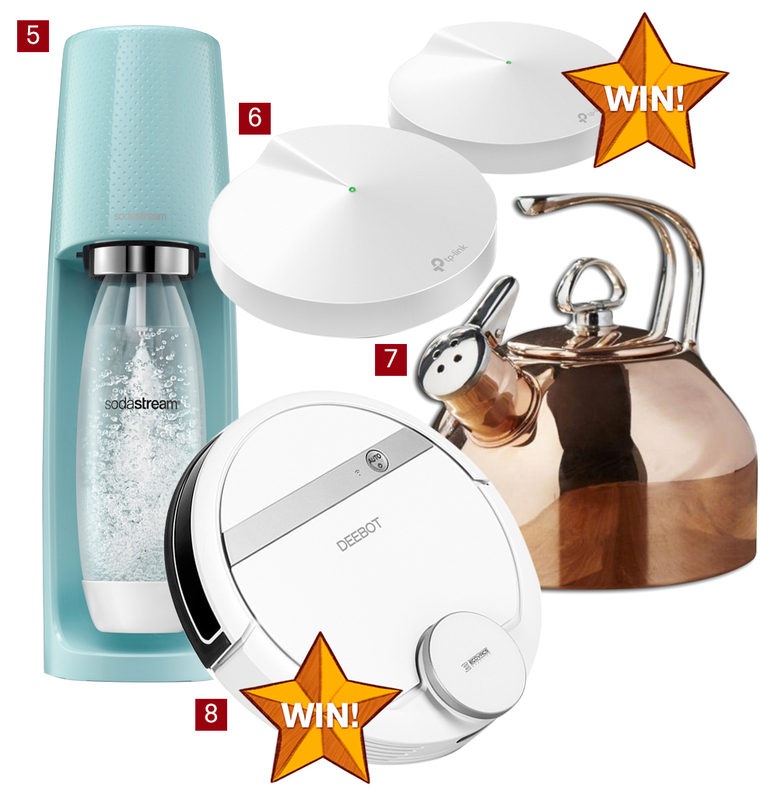 So we’re here to help you get the best housewarming gift award with some gift guide suggestions for your buddy that will be receiving their BTO flat soon. They’ll definitely appreciate these little indulgences when all their spare cash is going towards repaying the house loan. Fancy a pair of speakers that you can control your favourite music playlist wirelessly anywhere and everywhere your new home? This ultra compact multi-room speaker that delivers best in audio performance is all you need. You can place one in every room in your home and connect them wirelessly (via WiFi or Bluetooth). Take it out to the beach with an optional rechargeable battery pack. By the way, it has the latest Airplay 2 and connects to your Amazon Echo. The first step to making your house smart(er). The Google Home is both a virtual assistant and a speaker all rolled into one. If you get smart switches or a Chromecast, you can even link it to your Google Home for voice activated lights, curtains and TV. 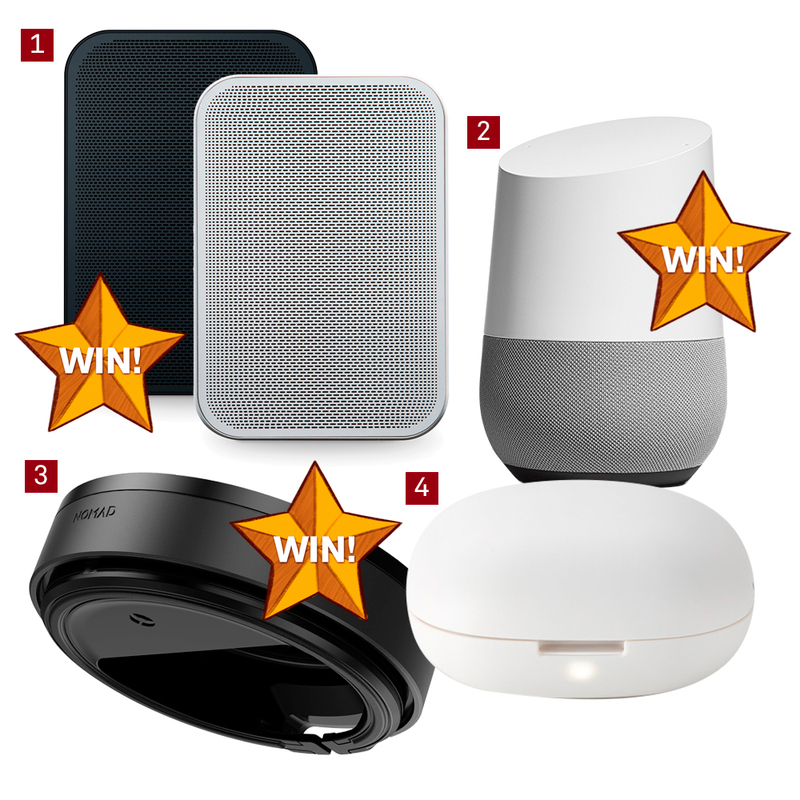 You can also link up a few Google Homes for surround sound throughout your house. The best companion to control everything? The just launched Google Pixel 3! This wireless hub has 4 ports hidden under the matte rubber top including: two standard 1A USB ports (good for Apple Watch, AirPods or wireless mice); one high-output 2.1A USB port (for faster charging! ); and one USB C port with a 3A high speed output. Super useful if you have more than three gadgets that need charging at your table — and especially if your smartphone supports the Qi wireless charging system. In the heat of the hot summer months in Singapore, running your air conditioner throughout the day will probably shoot your bills up through the roof. For a cheaper alternative, try diffusing cool and minty essential oils with this Muji Portable Aroma Diffuser. Best part is – it’s palm-sized, so it makes it really convenient for you to bring around with you! Sparkling or still? Why opt for the stale option when you can have your water in sparkling, carbonated form? If you’re a fan of that fizzy sensation in your mouth, then this is a must-have in your home — of course, you can make all kinds of mixes and fruity concoctions for your guests too. FYI: the sleek Icy Blue edition is launched just in time for the holiday season. This two-pack delivers Mesh Wi-Fi to all areas of your home or SOHO, up to 4,500 sqft, that is huge! You can also add more Deco units anytime to increase coverage or eliminate extremely weak signal areas. Deco M9 Plus also acts as a smart hub for your smart home devices like smart bulbs, sensors and switches. All we can say is… our office needs this. If you’re a houseware-design police, the Chantal Tea Kettle undoubtedly speaks your language. It’s a design icon to many, only with a twist for this year’s festive season, with a breathtaking copper exterior. The sleek design is known for its signature shape, iconic stainless steel handle (handle sleeve included) and two-tone harmonica whistle that basically sings when your water is boiling! Almost like a pet, the ECOVACS DEEBOT OZMO 900 Vacuum and Mopping Robot cleaner roams around the house by itself — but instead of making a mess, it cleans up! This smart home assistant has Dirt Detect Technology and cleans everything from small particles to large debris in your home. It works with Google Assistant or just ask Alexa. You can even schedule this WiFi connected machine to clean from anywhere and anytime through the ECOVACS App! 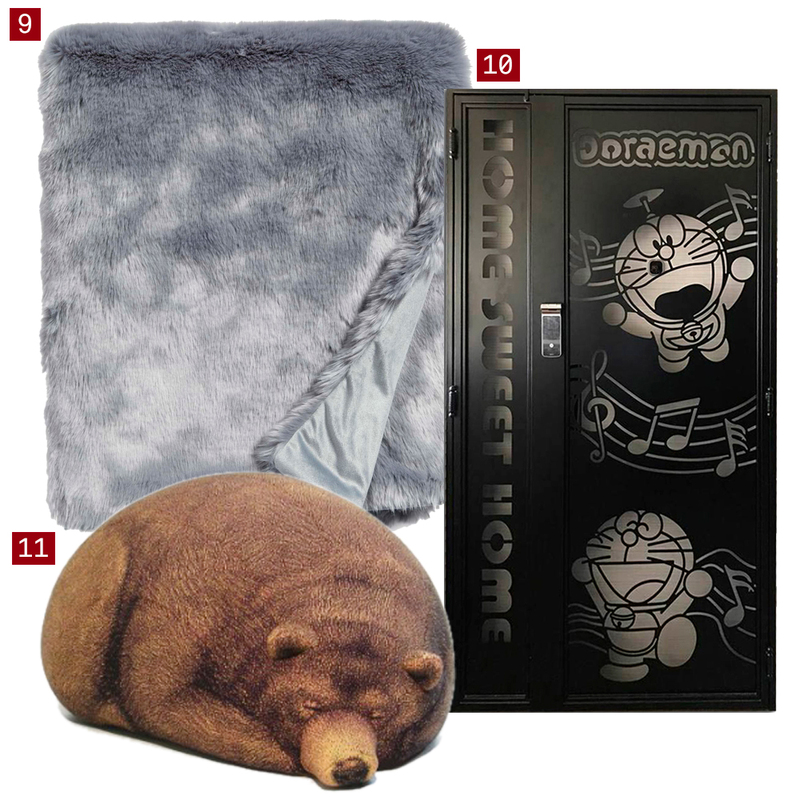 Okay, is your home really a home if you don’t have the Cuddle Up Faux Fur Throw Blanket? Snuggle up in the cozy throw blanket or drape it over your couch for decorative purposes. It will definitely modernise your home and the best thing is, no animals were harmed in the making of this faux fur blanket! Personalisation is all the rage when it comes to building a cozy house to call yours. Get an easily identifiable gate to stand out from the rows and rows of doors lining the corridor so that your friends can find your place more easily for the housewarming! Pick from template designs like Doraemon, Pikachu and Ironman, or just design your own for a more personal touch. Your neighbours are going to be so envious. This Grizzly Bear Bean Bag would make a GRRRR-eat edition to your home for you to sink in after a long tiring day out at work. Besides its adorable design, the bean bag will also come in handy on days when you just want to snuggle up while watching some Netflix at the comfort of your own home. Waffles: picture crispy, golden brown batter with a light and fluffy inside. Our point is, waffles make great breakfast food. There really isn’t a better gift than the stainless steel Cuisinart Vertical Waffle Maker, which takes up less space on kitchen counters compared to the usual waffle makers. With indicator lights and an audible alert, the waffle maker is foolproof and will not spill over the edges. If you’re all about smart home gadgets, we might just have that one thing you’re missing! The EKO EcoSmart Sensor Bin is armoured in high-quality stainless steel that adds class to any home decor setting. Yes…a classy trash can. Its patented sensors will allow you to dispose your trash without touching your bin, if your hands are full or simply for hygiene reasons. Can your home get any smarter? We know, Taobao or not, anything “made in China” has to be inspected very, very thoroughly — but look again, we’re featuring cheeky lifestyle brand Maid In China instead! Any dreamy home deserves this whimsical tea set, where the cups and saucers can be hung on a merry-go-round after you’re done with your afternoon tête-à-tête. 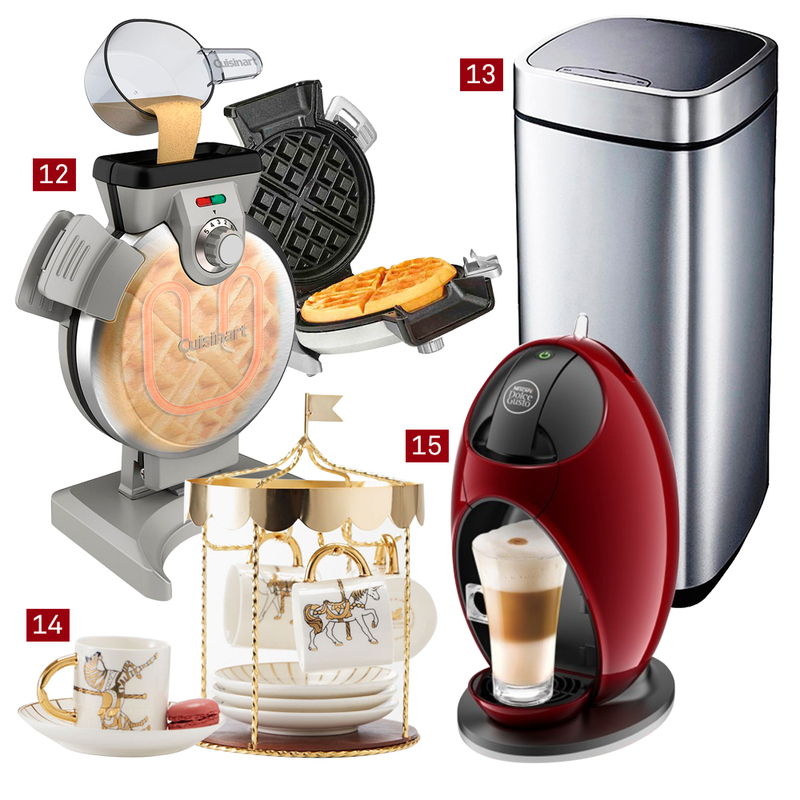 Coffee just tastes better when it’s from a machine… because you can brew a fresh cuppa right at home! Not only will you never have a bad cup of coffee again, the stylish design of the Nescafe Piccolo Coffee Machine will be sure to add fancy into your home!